All transactions are safe and secure with a reliable history in online purchasing behind each of our associates. Buy the Friday Night Terror t-shirt to own Friday the 13th clothing and merchandise. 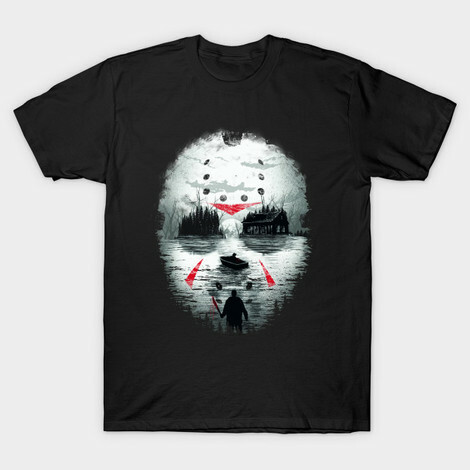 The design on the front of this bestselling Friday the 13th t-shirt features an image of Crystal Lake that as a whole creates Jason's mask. The design displays Jason holding his bloody machete as he stares out at his next victim in a row boat. The moon is casting an eerie light over the water and two cabins can be seen across the lake, which together create the hockey mask's eyes. Wear the tee by itself or with a Jason Voorhees' hockey mask for a fun costume. This Friday the 13th merchandise item is perfect for fans of the classic horror movie. Browse the movie mask in the gallery. In addition to the Friday Night Terror tee above, browse the Friday the 13th Clothing Gallery for more apparel like men's and women's clothes, kids shirts or hoodies.